You know that tingling excitement you get when you try something on for the first time, especially when it fits and what looks back at you in the mirror looks pretty good? Yeah, you know. That’s kind of what last week felt like. The week’s events started last fall with an email from Quarry Farm Friend Robyn. 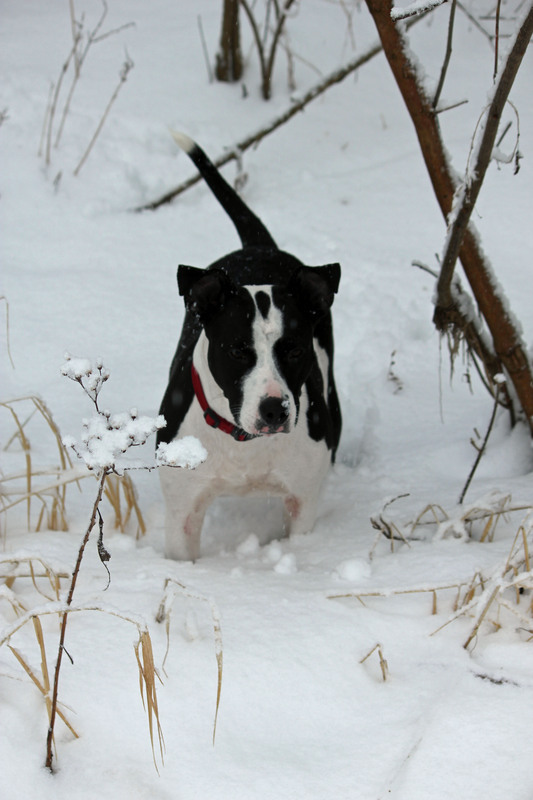 The trails here are not new to her or her family. In fact her son Zane is one of our best advisers during programs. Zane is kind of a barometer—if he’s happy with the program’s progression, we go with the flow. Anyway, Robyn is a Findlay teacher who recommended us as a field trip destination. So back at the start of School Year 2016-17, her co-worker Alyson scheduled a spring field trip. After the ball dropped in January, Ada Girl Scot Leader Cathy called to schedule a three-badge (Hiker, Bugs, and Animal Habitats) for Brownies and Juniors. A month later, I entered Erie Conservation District‘s “2017 Recycled Runway: A Clean Water Cause” on behalf of The Quarry Farm. None of these things are truly new. We raise our hands all the time. In fact we all but shout, “Pick me! Pick me!” in order to fulfill our mission statement. What was a stretch is that all these things were set to happen in the same week in April 2017. On Sunday, we fortified ourselves with chocolate and other Easter basket contents. From Monday to Thursday, 218 Findlay preschool students, their teachers, parents and bus drivers made lasting-leaf t-shirts and followed the Cranberry Run Trail to meet the farm animal sanctuary residents before making the bus ride back to Hancock County. The mornings were cool and afternoons exceedingly warm, but Miracle Max the Bronze Turkey was always the gate greeter for every group even if the other animals dove for cover. We made the Final Four (whoo Hoo!) and they raised $10,000 towards increased water quality. Check out the media photos. Saturday morning, the Ada scouts reused bush honeysuckle to make hiking sticks, hiked habitats, tasted garlic mustard, and met the animals. Max was red with happiness. Today we rest. So does Mister Bill. Looking in the mirror, or at the photos and videos on our cells, and through the perspectives captured by others who shared the stage of the day, we’ll still keep raising our hands. Lots of things are happening along Road 7L as summer rolls in: Summer Family Day, art workshops, the 3rd Annual Quarry Farm Jam and, looking ahead to autumn, The Quarry Farm 5K. But don’t wait to run or walk that last one; there’s a virtual event starting June 17. Click on the cover to the left, see what spring brought and mark your calendar to-do list for the months of high sunshine. There’s a lot of history in and around The Quarry Farm, not to mention up the road. On the opposite side of the block stands a log home constructed by Tom McCullough. Like our Red Fox Cabin, McCullough’s place isn’t a Putnam County native, but did stand in the United States during the country’s first 100 years. The 2.5-story building started out in Reading, Pennsylvania, was relocated here in 2008 and reconstructed by a professional antique cabin firm and kitted out with local 19th century furniture. North on the same road and across Riley Creek is Bridenbaugh Schoolhouse. Imagine a one-room schoolhouse on every country mile and you will picture the education system as it once was in rural Ohio. In 1997, Dale Bridenbaugh restored the schoolhouse on his farm to what could have been its original 1889 glory. Cross the Riley on the c. 1876 M-6 bridge, itself listed in the Historic American Engineer Record as an example of “Morrison’s Patent Wrought Iron Arch Truss Bridge,” travel about a mile and a half north on 7L and sit in the stillness and peace of Riley Creek United Methodist Church. The church was founded in 1850 and is still active in one large, lofted room. Sun and moonlight filter through etched and stain-glass windows to pool on handmade wooden pews. The long upright-backed benches glow with the hand polish and years of congregational sitting, but the names of former youth break the smooth surfaces here and there. Saturday broke records for December warmth and, although we could use some rain or snow to soften the dry bed of the quarry, the weather was perfect for the first Old Time Riley Creek Christmas Tour. All of the above were stops on the route. All were decorated for the holidays, most as they may have been long ago. Riley and Pleasant Township saw plenty of driving tourists as a result. One of the visitors was Pandora’s Dr. Darrell Garmon. He walked up the path through the Red Fox Cabin gardens and introduced himself as Dr. Garmon and as the person who poses as Sea Captain James Riley. Next door, Carlton, Beatrice and the other potbellies, a speckling of chickens and Johnny Goose gathered at the farm animal sanctuary fence corner closest to the hubbub. Lucy’s foghorn bray paused more than one conversation. 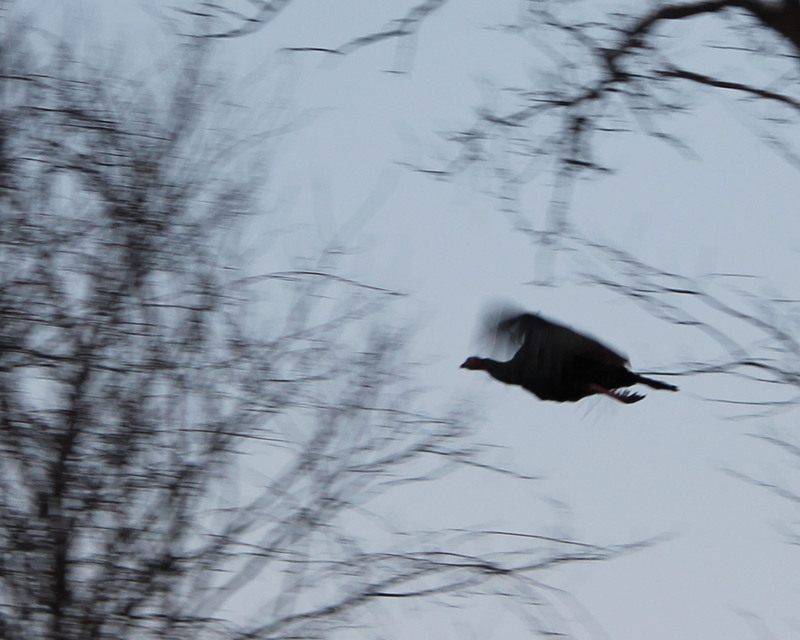 Two tourists left the cabin and stopped at the gate where the turkeys were on full display. Buddy took issue with the attention the boys were getting, so he grabbed a mouthful of tail feathers, spit them out and smiled. True story – the couple took a photo and promised to share it with us. For now, the images above will do. Everyone has stuff to do. 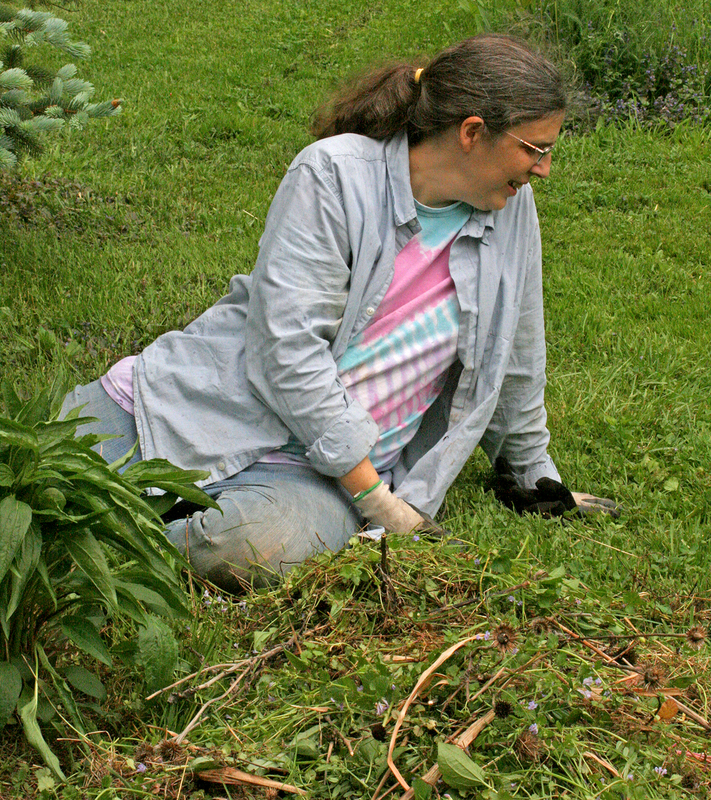 Some of us are list makers, like Quarry Farm Board President Laura. Others have swirls of snippets of chatter spinning through their brain, like yours truly. Or little notes jotted on the backs of envelopes stuffed in the glove compartment, drawers and/or stacked on the kitchen table (again, fingers pointing right back.) Here on The Quarry Farm, there is always so much to do. Water tubs and buckets to clean and refill, food to prep and food bowls to juggle, hungry potbellies to restrain, hinnying donkeys to brush, and buildings to clean, rinse and repeat. This year, we have buildings to paint. And that’s just in the farm animal sanctuary. In the gardens of Red Fox Cabin, the long wait for nature to prevail over invasives is one which has yet to be won. But Nature is making headway, with a little help from her friends. After years of solarizing beds and hand-picking beetles rather than spraying and dusting, has allowed natural insect predators to get a foothold. The gigantic rainbarrel that collects droplets from the roof of Red Fox Cabin is almost always full for the watering. But those of us who currently ‘mind the store’ rarely have the opportunity to check everything off our wish list. Last Saturday — that golden day — we got to pen a whole host of checkmarks. About a month ago, I received an email from William Schumacher. 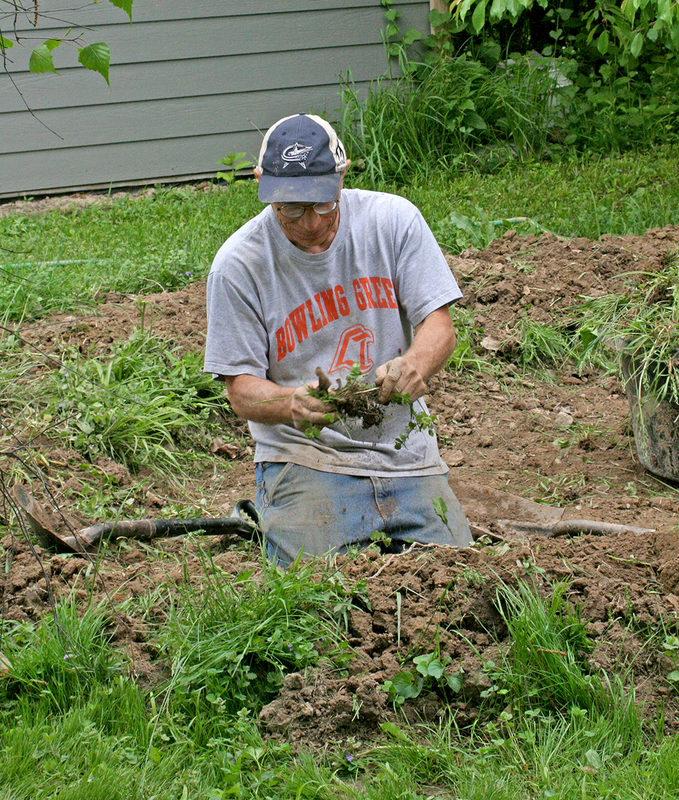 I first met Bill when an Ohio Department of Natural Resources co-worker suggested that the man, an Ohio Environmental Protection Agency employee, might be willing to lend his expertise as a soil science presenter at a teacher workshop I was planning. It turns out that actually wasn’t the first time that I met Bill. He and his brothers Joe and Dan grew up along the opposite bank of Riley Creek. We rode the same school bus and developed the same love for nature while walking the creeks, pastures and woods. Getting back to that email. Although Bill and his brothers no longer live nearby, they remember. They remember the fish that swam in Riley Creek and the pasture that their dad tended for years. And they’ve seen what happened to the creek when that floodplain pasture was plowed and subsequently eroded. They like the clear waters of Cranberry Run that flow through The Quarry Farm on their way to the Riley, so much so that Bill offered up his helping hand as well of those his wife Carol and their teenaged daughters and sons. Since his brother Joe was flying in from South Dakota and his brother Dan would also be up from the Dayton area, why, they could bring up their tools and pitch in to help us out, too. Boy, did they ever. When Sophie the potbelly pig arrived here last month, she was so overweight that she couldn’t walk, much less be spayed. In less than eight hours, we had a new wooden fence in the quarantine area where Sophie is now dieting. 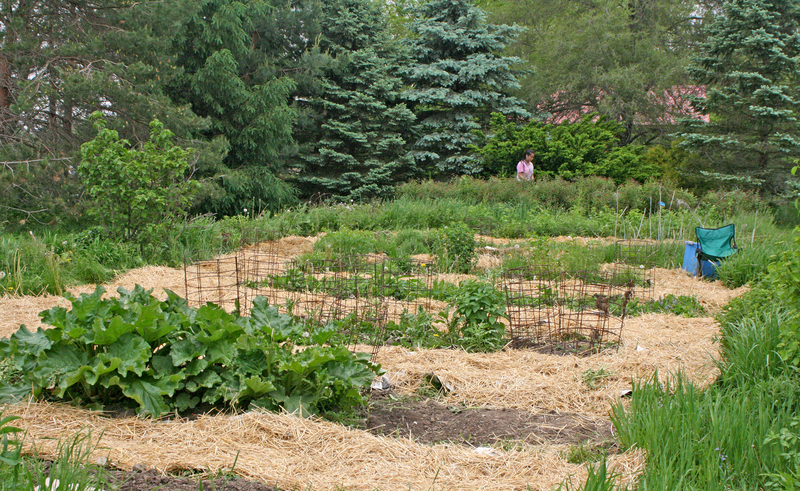 The butterfly gardens were weeded of quack grass, with straw down between the rows. Bill had dug and walled a kidney-shaped raingarden off the north gable of the cabin. 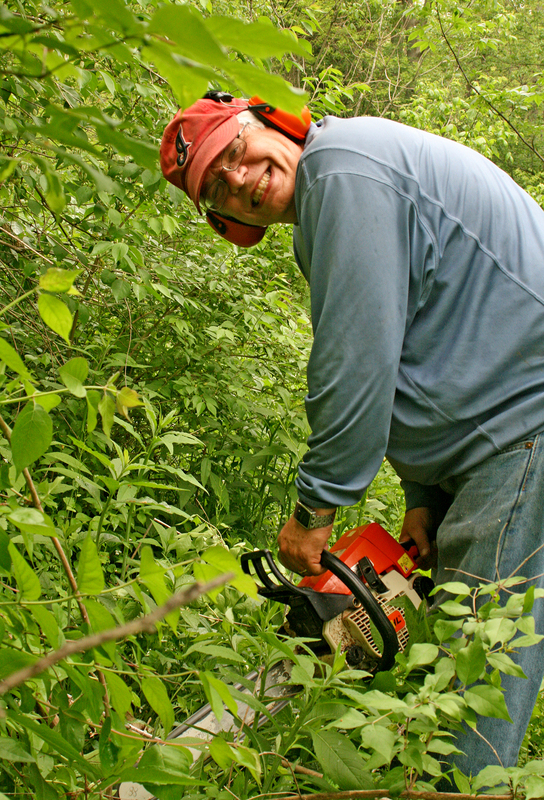 Dan had led a crew along the south end of the Cranberry, clearing windfall from the path and cutting a big dent in bush honeysuckle along the way. Words cannot sufficiently express our gratitude to the Schumachers. Instead, I’ll let the impressions of some of our youngest visitors say it for me. These drawings just arrived in the mail, sent to us by the third grade class from Pandora-Gilboa Elementary School following a day spent here on May 8. Those kids are one of the greatest reasons why we do what we do, so that these creeks, pastures and woods, as well as the nonhumans that share it, will mean as much to them as they did to much younger Bill, Joe, Dan and me. Still do. Turkeys woke us up Monday morning, woke us up to at least a couple of inches of new snow. Not this turkey. 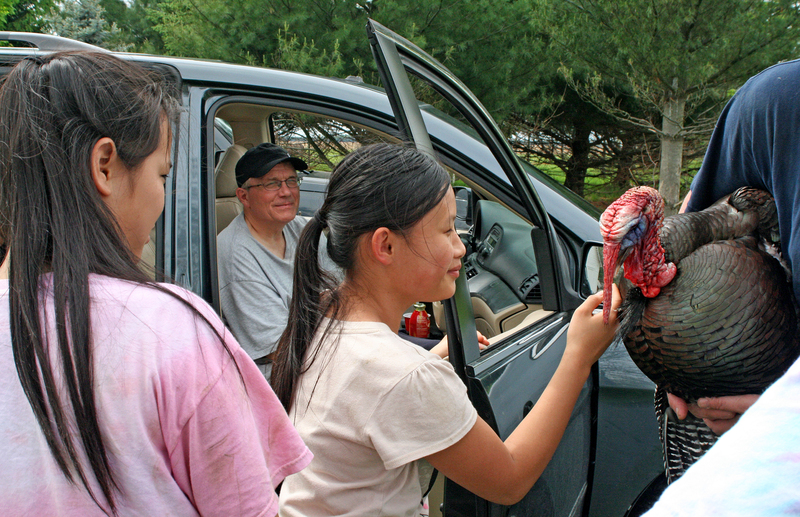 This is Inigo, one of the domestic bronze turkeys who live here in the residential neighborhood of The Quarry Farm. And not the turkeys pictured first. Well, probably not them, at any rate. It could be, I suppose; they’re representative of the wild turkeys that live here, but probably not, as that photograph’s at least two years old, possibly four. 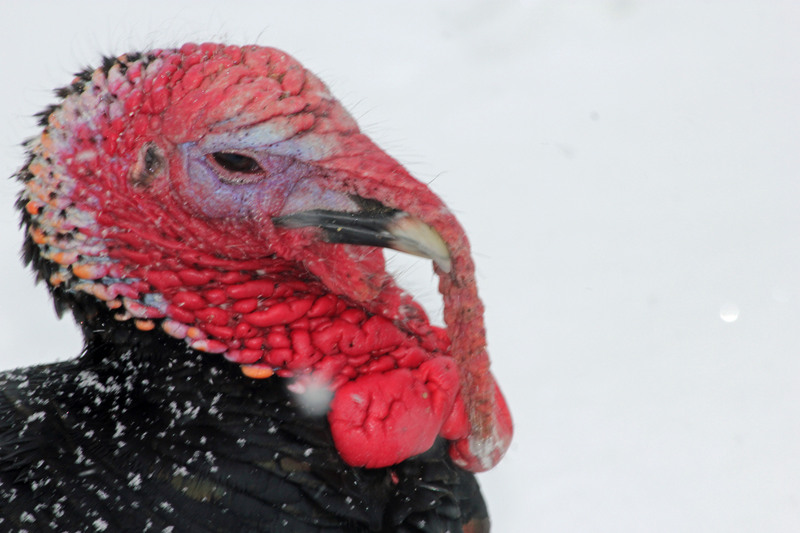 While turkeys in the wild are known to live to the ripe old age of 14 years, the average lifespan is only three. So, possible, but not probable. More likely, it was this one, though it’s a poor likeness. Him and his friends, no doubt. He made himself known late this evening, pacing back and forth along the fence line that separates the sanctuary from the preserve, the domestic from the wild, chortling to himself or to a hen on the other side of the fence. I crept out with the idea of getting a good photograph. He’d have none of that, though, and took to wing. But back to yesterday morning. Outside the house, through the doors and windows, there was a whole lot of white. All that new snow made Lolly twitchy. For her, it was like a clean canvas to a painter, an empty page to a writer; she just had to go out and make her mark. Monday morning’s walk was very much like Sunday’s, though there weren’t as many tracks readily visible as the day before. The new snow had covered the old and there weren’t nearly enough intrepid explorers out and about before Lolly and I got there. We did see some eastern cottontail rabbit tracks and what we assume are fox tracks; at least, that is how they appear to us. 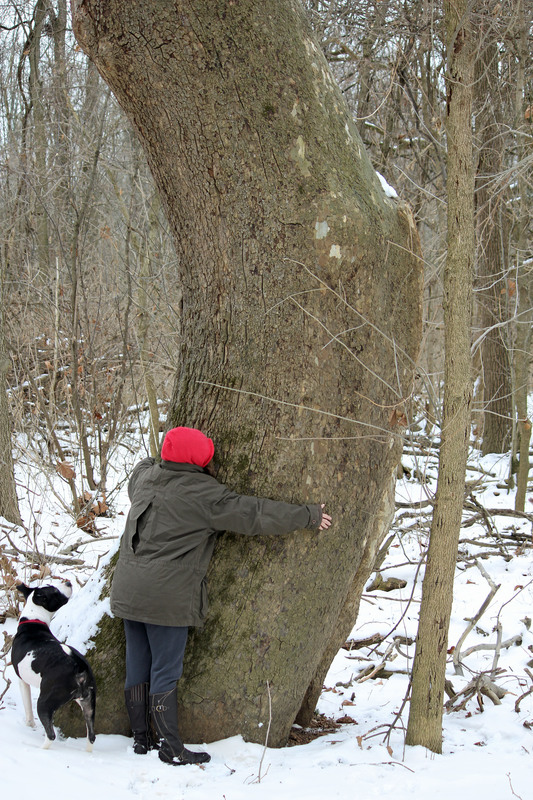 Lolly almost first thing scared up an eastern fox squirrel; scared it right up a series of consecutively larger trees, in fact, until it settled in a big, old sycamore that sits just up and off the path. Lolly must carry herself with a certain amount of menace, because that squirrel left the better part of its hedge-apple breakfast behind. If that squirrel only knew, it would have blown a raspberry and kept right on breaking its fast. Off we went, then, along the path some more and across the bridge and skirting the edge of the quarry, covered in a blanket of white with hardly a mark on it. 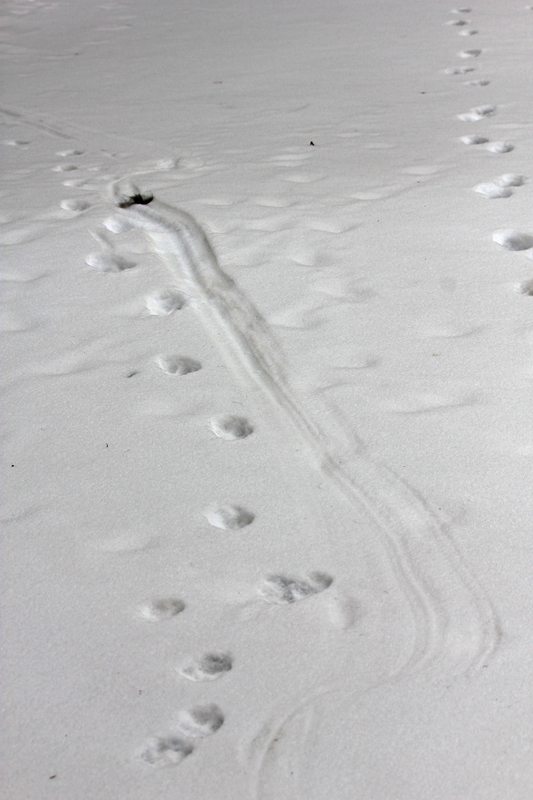 Just the tracks of that rabbit I mentioned earlier. We could hear the occasional bird, but they were keeping their heads down; down and tucked under a wing, most likely, out of the snow. The big back field was as quiet as the quarry and we passed through without seeing much of anything. Rounding back, we took to the path that leads down into what some locals refer to as Coburn’s Bottom. 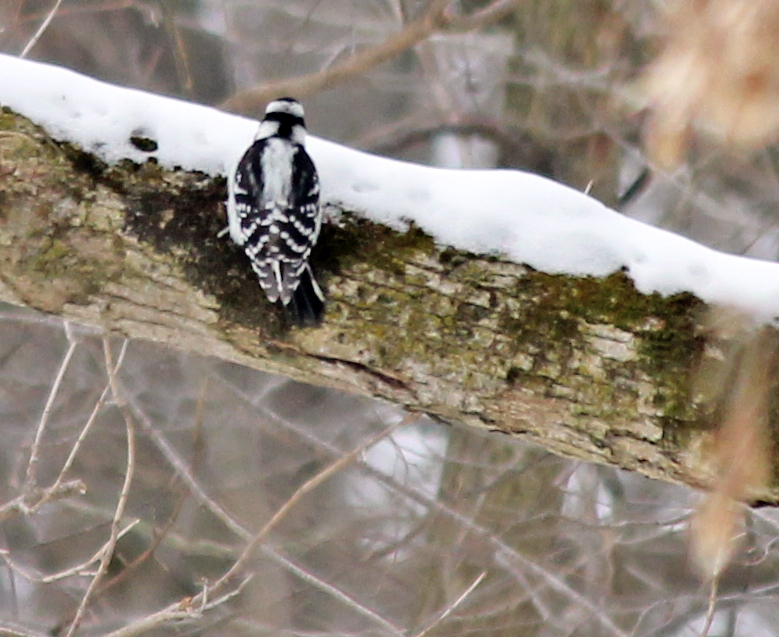 We saw a downy woodpecker or two and signs of them in some still-standing dead trees. 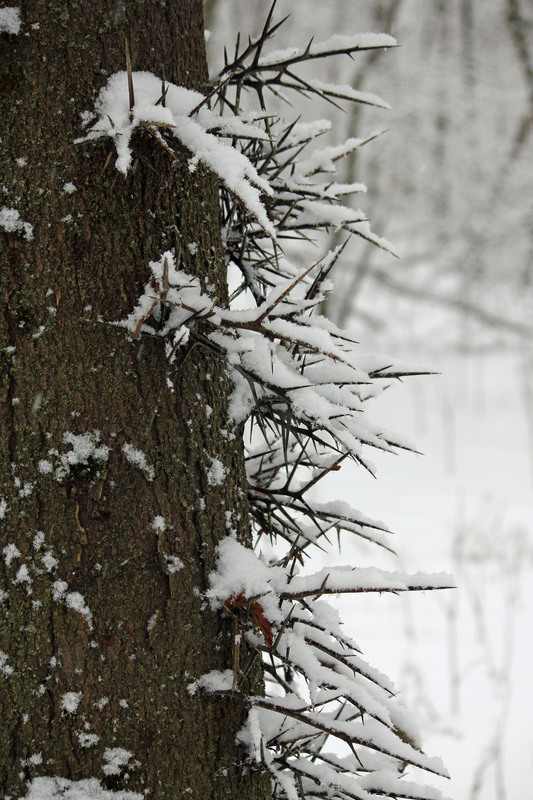 The thorns on the honey locust trees (Gleditsia triacanthos) were softened with snow, though you’d sooner want to kiss a porcupine than hug a honey locust; the wild ones, anyway. 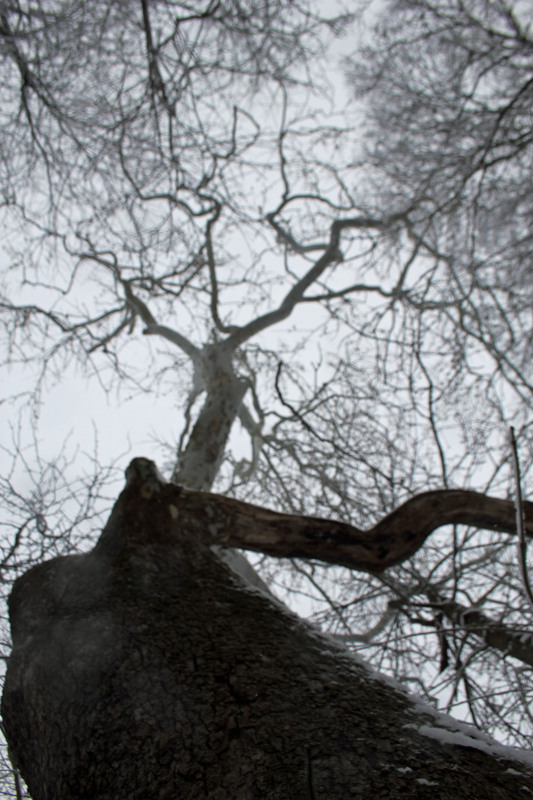 A little farther on and we came to a magnificent old gentleman of a tree; a huge and stately American sycamore that Anne calls by the name of Old Man Sycamore. There are any number of American sycamores (Platanas occidentalis) growing within the riparian areas of The Quarry, and we’re pleased to have them. 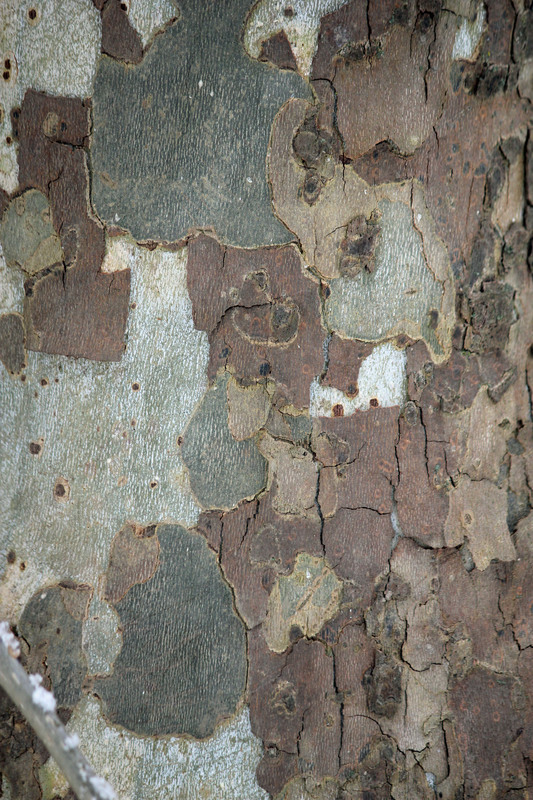 The trunk and branches are of a mottled color, with reddish brown, pale gray, light green and olive shades of bark setting side by side in irregular patches. 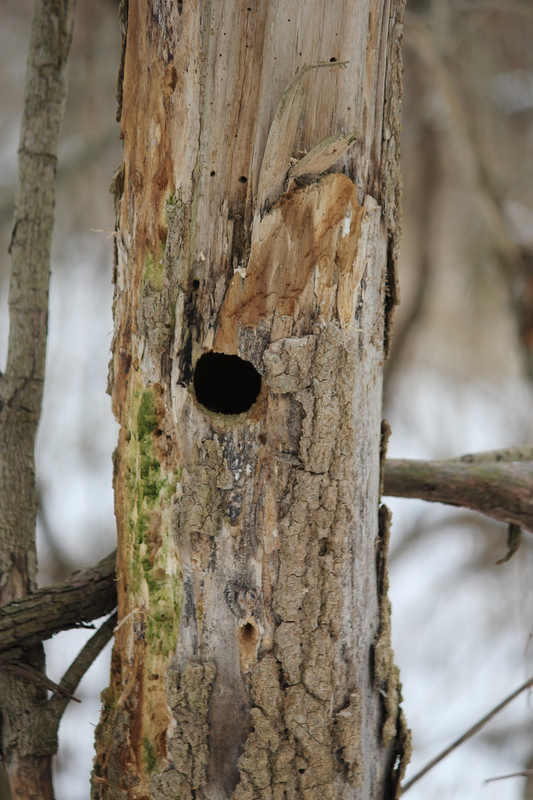 This is because the bark of the sycamore isn’t as rigid as the bark of other trees and sloughs off in patches, leaving a pattern created by different layers of bark. A hardwood, sycamores have been used for furniture, siding and even the creation of musical instruments. Because they’re so hardy, they do well in urban and suburban settings, and they do grow quite large; four foot in diameter is common and 70 to 100 feet tall isn’t unusual. Their canopies are welcome on hot summer days and even their stripped branches in winter offer a good deal of shelter from the elements. As for Old Man Sycamore, he’s a good four and a half feet in diameter and fifty feet high. That he’s had to work to get to sunlight is apparent. 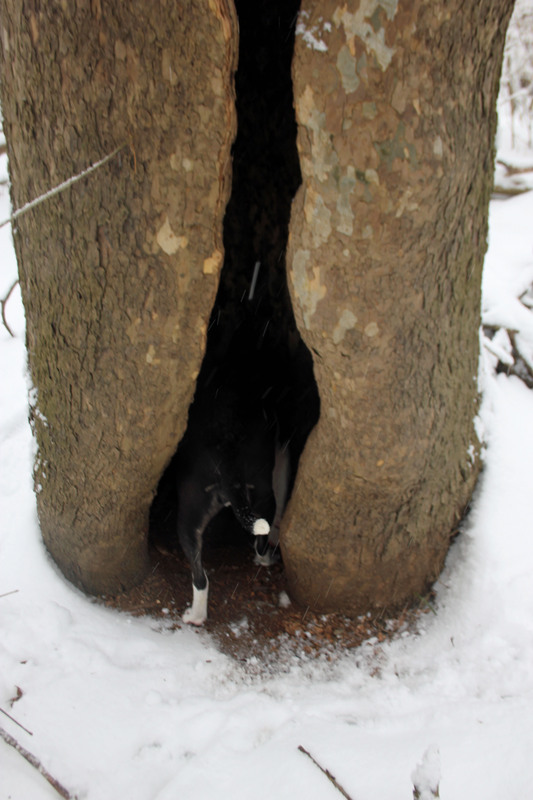 His trunk has a great bit of a bow to it where he worked his way past a rock, another tree that has long since passed or some other unknown obstacle, and his trunk bears a wide rent in the southern side that opens out into a wide cavity. 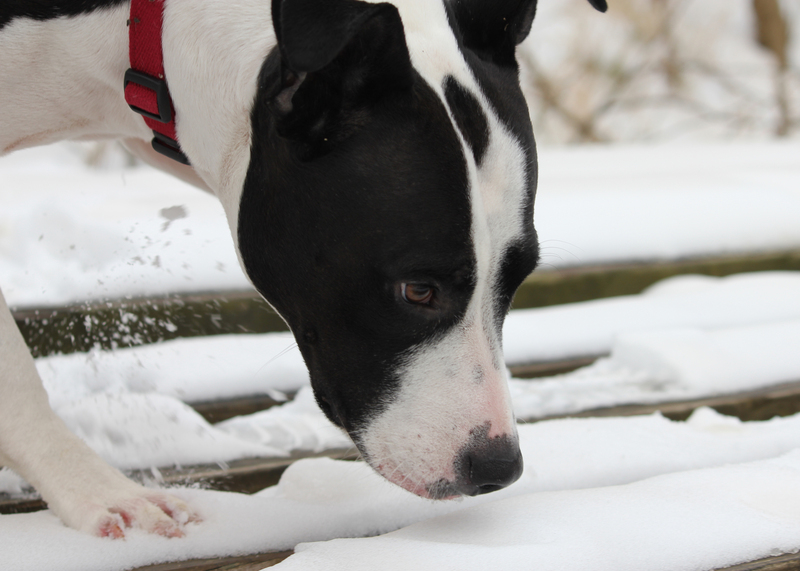 Lolly just couldn’t keep her nose out of it…then her shoulders. 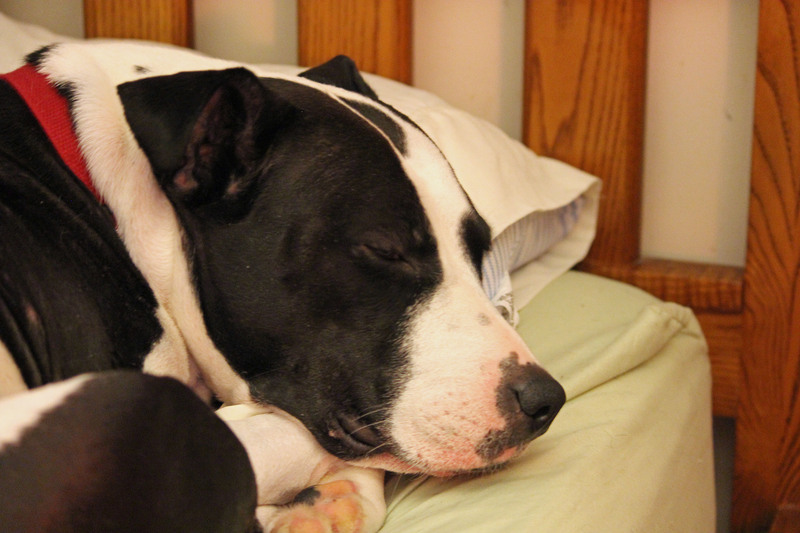 Finally, all but her tail was snug inside. There’s a nice swale near the Old Man that’s formed by the run-off from the vernal pools down into Cranberry Run and we took advantage of it to walk out onto the stream. 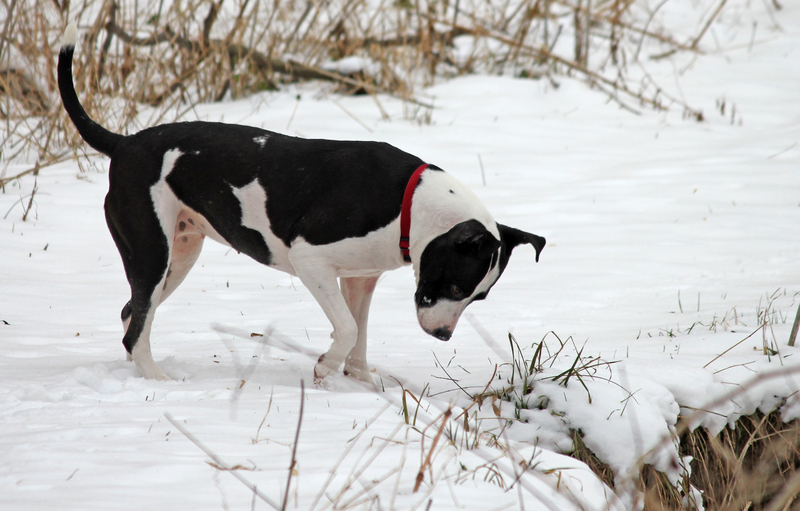 Lolly and I followed the Little Cranberry for quite a ways, though every time the ice cracked or popped, Lolly hopped and scurried forward and away. Eventually, though, we made it back to the ford without much incident and out and back up to the house. And so ended a nice morning walk in the woods, with Lolly curled up on our bed, licking the warmth back into her feet and me easing back with a hot cup of Earl Grey. There’s a man we admire who lives near the Forest of Dean. We are genuinely fond of him, though I don’t even know his name. I simply know him as The Tramp. He walks about the Forest, taking pictures of whatever catches his eye, turns his feet home and then cracks open his head and spills an absolute treasure trove of knowledge about the world around him into the ether (if you’ve not yet met him, haven’t found him through social media or some obscure search or simply missed him through sheer bad luck, here he is: https://atrampinthewoods.wordpress.com/). We do, however, know the name of his companion, his Sancho Panza. I think it’s probably safe to say that The Tramp would find his wanderings considerably less in so very many ways without her. Her name is Fizz and she’s every bit as curious about the world around her as any tramp. For those of you not near the here we’re at, it’s been cold; so cold that walks to retrieve the mail are arduous undertakings requiring planning, oversight and at least five layers of clothing. Today, however, (and likely tomorrow, if the forecasters read their scattered bones correctly, scried sincerely their battered leaves of tea), it’s been comparatively balmy; nearly 30° F. On Tuesday, though, we’re back into the basement, temperature-wise. So, given that we’ve been cooped up for the better part of a week, we threw open this window of opportunity and bounded back into the woods, Lolly, Anne and I. 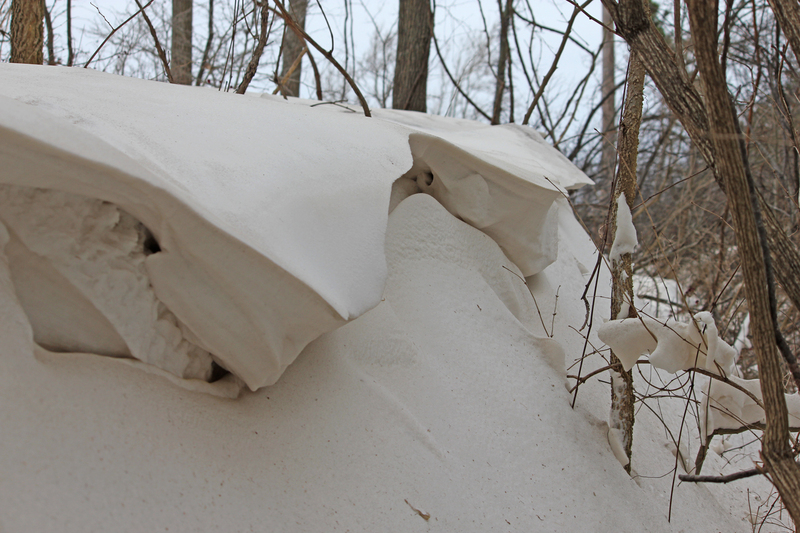 First observation of the day: snow is ever so much whiter under the crust. The winds that have battered this area have stripped the topsoil from all of the surrounding fields and tossed it until it couldn’t be tossed any further. Where it falls it lays in blankets, ribbons and bands of varying shades of brown. Sometimes you don’t even notice it until you’ve taken a step or two, all that dirt being evenly distributed so that there’s just no way of knowing. Other times, you just can’t help but see. 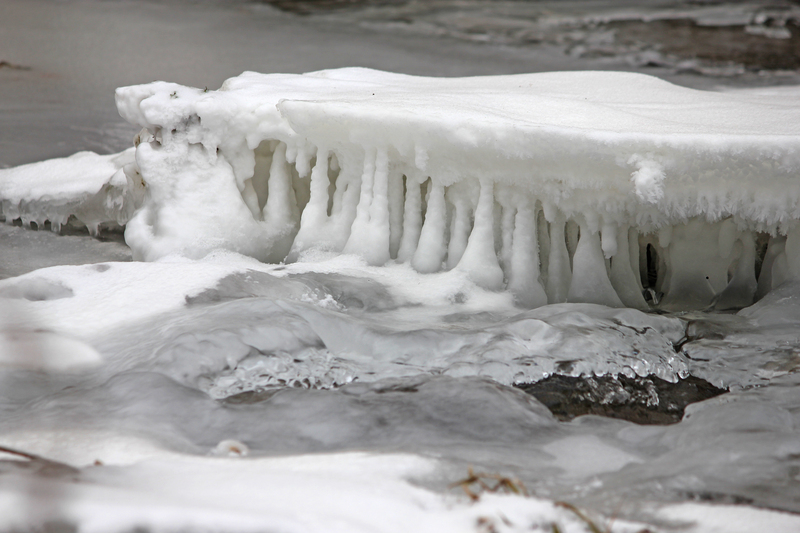 That same wind, though, did interesting things to what little snow has fallen, pushing what must have been little more than two inches of overall snow into two- and three-foot deep frozen waves caught in the process of cascading over the lip and down into the stream bed. Cranberry Run itself is frozen along most its sinuous length, with water breaking through the ice only along the most turbulent runs. On the paths we’ve carved through the woods, down on the frozen stream and across the quarry itself were sign after sign after sign of the many and varied creatures that live here. 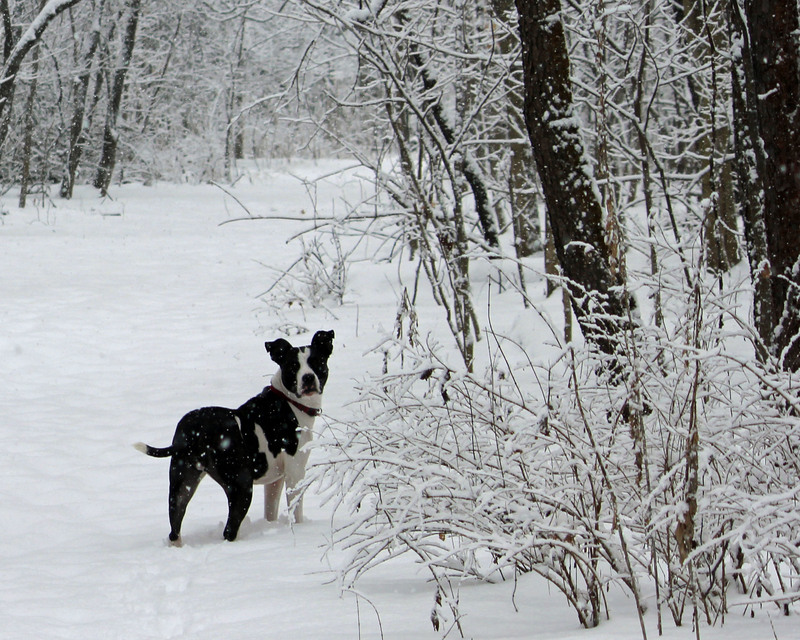 Tracks of rabbit, squirrel and raccoon crisscrossed those of turkey and deer and a host of songbirds. There were even what we suspect were fox tracks and signs that at least one fox was successful at the hunt. Though we’ve not yet managed to photograph any of the foxes that we know live here (we know of two active dens), we hear them at night, interacting with one another in eerie, high-pitched yowls and sharp, barking yips and growls. We’re researching trail cams, at the moment to help us capture visuals and have acquired some sound equipment with which we hope to record the voices of The Quarry, once I’ve figured out how to effectively use it. 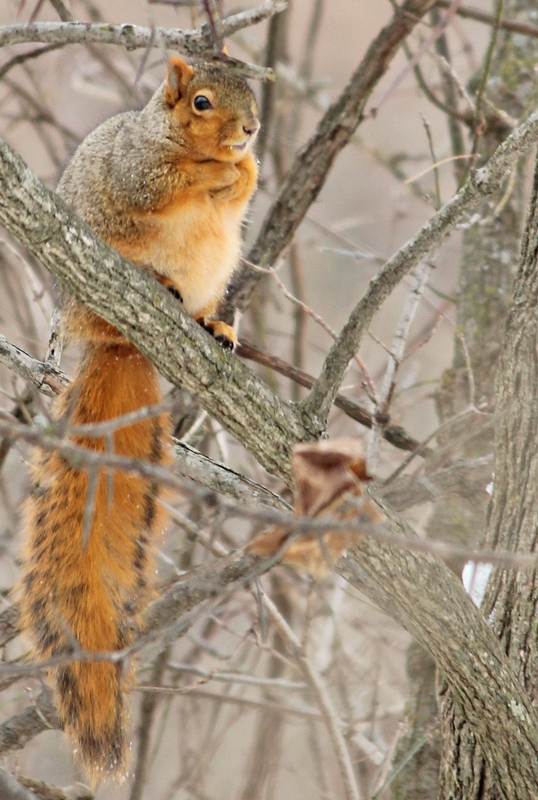 In a tree on the spit of land separating Cranberry Run from the old quarry, a fox squirrel sat on a branch and watched us walk on by. He was fat and sassy and at least one of the reasons for his good health soon became apparent. 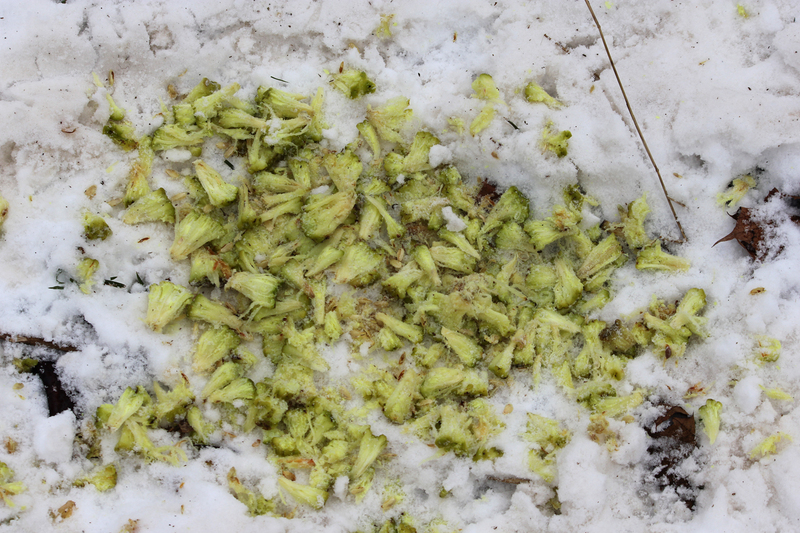 Scattered here and there were the remnants of osage oranges, the seed fruit of osage trees. The osage tree (Maclura pomifera), also known as the hedge or hedge-apple tree, is one of the most commonly planted trees in the United States and is used as a field hedge, wind break and to stabilize soils. Unlike apples, pears or cherries, the squirrels tear the tree’s green and yellow fruit apart to get at the seeds, not the flesh. Remnants of their feasts are scattered in oval patches here and there along the stream and back in the woods. Though there’s little doubt that many simply went unobserved, there seem to be fewer birds about than in past years. 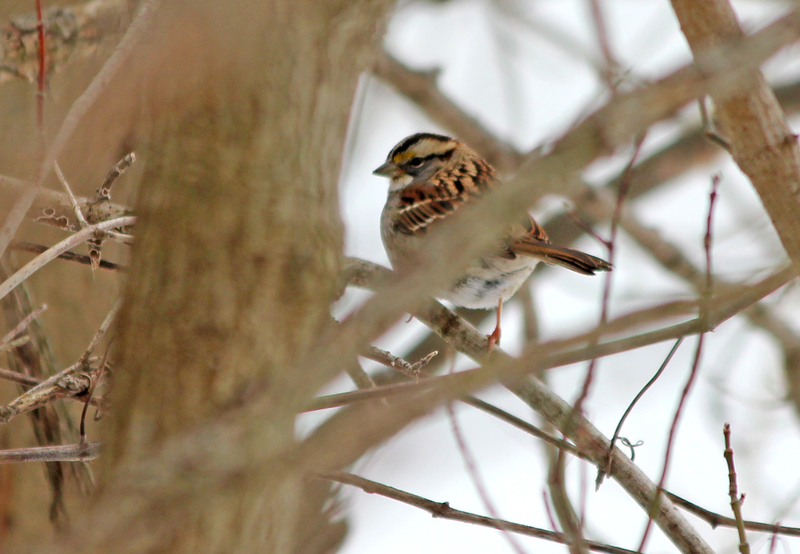 We did, however, see various sparrow species, juncos, cardinals, bluejays and several downy woodpeckers flitting from and between the trees. Tomorrow, if the prognosticators are correct in their prognostications, we’ll probably take the time to do this again. One of the primary goals at The Quarry Farm is to increase understanding, to educate. Sure, we provide sanctuary to animals in need, have established a preserve for the area’s wildlife and offer folks the chance to just kick their shoes off and relax. But, during every interaction that takes place in the name of The Quarry Farm, the primary goal is to provide, and learn, new insights. 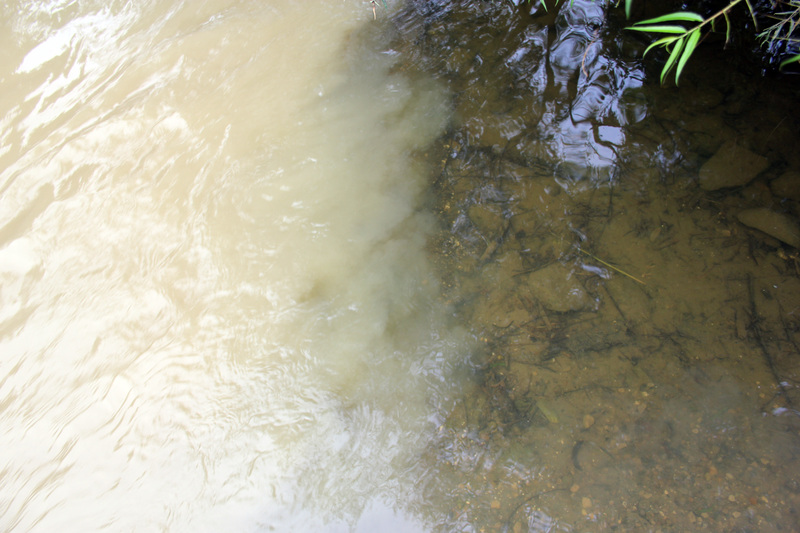 Arguably, the topic that gets the most attention is water quality. We have a number of programs that we present on the subject, everything from simple, on-site discussions of the various aquatic habitats that help make up The Quarry Farm, to Small Streams, a project that allows us to set up aquatic microhabitats in schools and community centers. 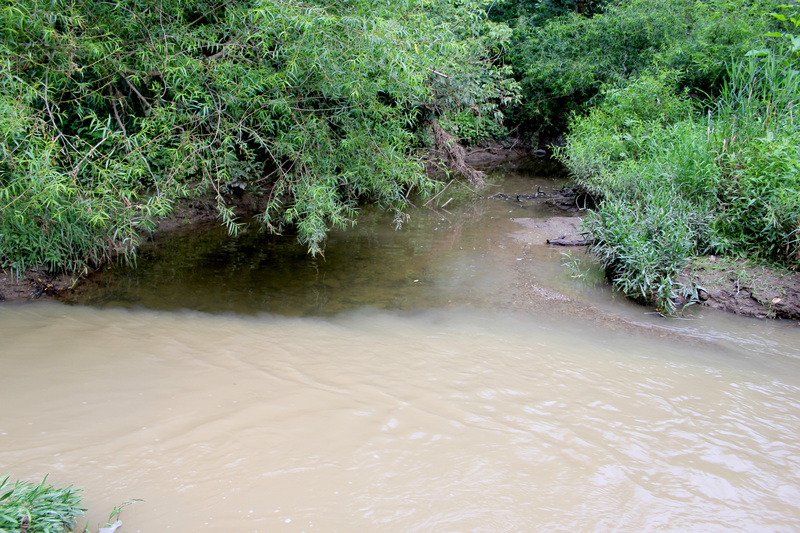 During any presentation on streams and rivers, the question that invariably gets asked of us, and that we in turn ask of visitors or classrooms, is this: What’s the biggest pollution problem facing the waterways in rural Ohio? The responses to that question nearly always include garbage, oil (or some other petroleum product), manure, chemicals, litter and, inevitably, dirt. The correct answer is included in that list and it’s having a profound effect on everything, from the Great Lakes to the shortest of creeks, like roughly five-mile long Cranberry Run, a stretch of which runs through The Quarry Farm. In the late ‘80s and early ‘90s, Gerald and Laura Coburn, after years of civil protest, negotiated an agreement with the counties that would allow Cranberry Run, or at least that portion of the stream that ran through their property, to reacquire a more natural presence. Within the first decade, the four natural stages of a waterway – riffle, run, pool, glide – reestablished themselves. Trees rooted on the bank, grew and began to provide shade, cooling the passing water and creating a more hospitable environment for all manner of aquatic insects and fish. Today, Cranberry Run snakes its way for approximately one-half of a mile through The Quarry Farm. The meanders in the stream bed slow the water flowing through here enough that sedimentation occurs and, on most days, the “Little Cranberry,” as it is affectionately known, runs so clear that visitors can’t help but comment on its clarity. Cranberry Run as it approaches its terminus, Riley Creek. And that, returning to the question of “what’s the biggest contaminant,” should help provide the answer: dirt. Dirt is our greatest concern and the biggest problem facing all of the animals that live in the water, from insects to mollusks to fish. Not only does dirt, suspended in solution, absorb the sun’s rays and increase water temperatures to dangerous levels for the animals that live there, but it carries with it chemicals bonded at the molecular level and creates an environment in which aquatic organisms find it increasingly difficult to breathe. Imagine standing downwind in the smoke of a brush fire, not for a minute or for an hour or for a day, but perpetually, forever. 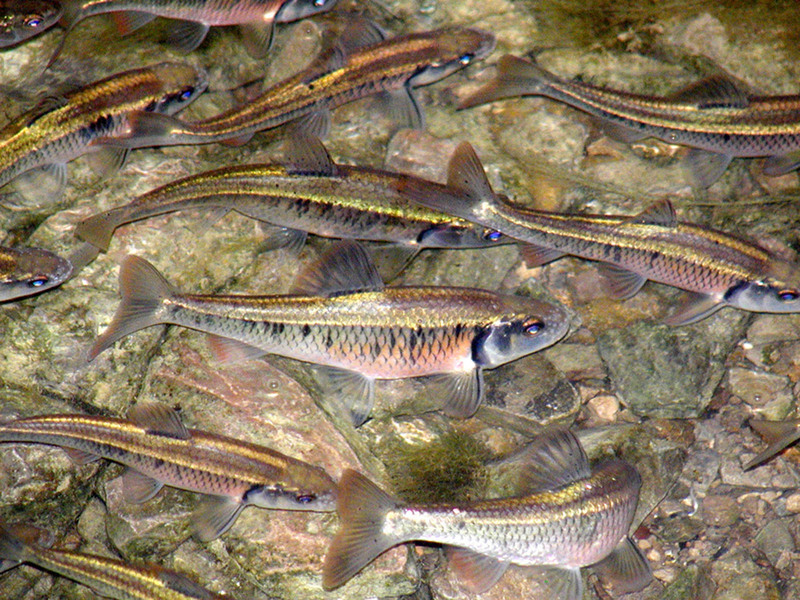 For gilled animals living in highly turbid water, they may as well live in the smoke generated by an eternal tire fire. 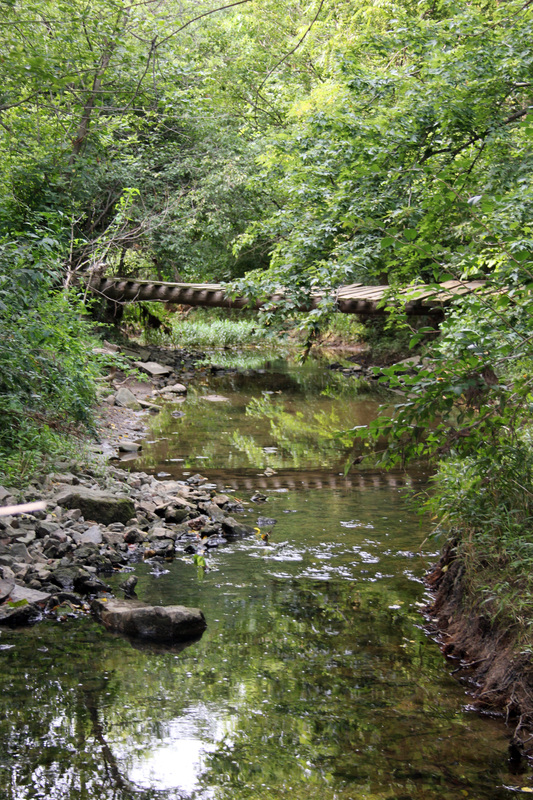 Pictured above and below is the point at which Cranberry Run enters Riley Creek. 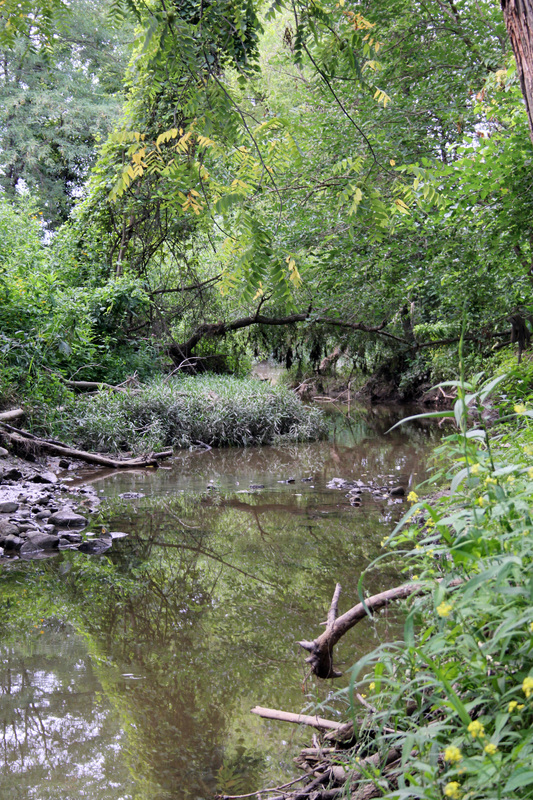 Efforts made within the boundaries of The Quarry Farm, and upstream by like-minded neighbors, have nearly erased the sediment load in the waters of Cranberry Run. 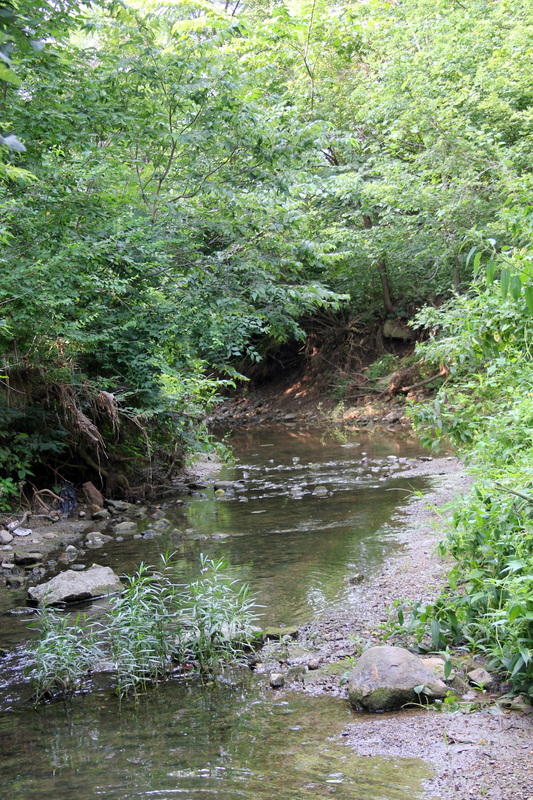 At left is Riley Creek as it flows northwest to the Blanchard River; the clear water to the right flows from Cranberry Run as it meets and enters Riley Creek. Efforts on the part of private individuals and organizations, and through governmental programs sponsored by state and federal agriculture departments, are beginning to have an effect. Public awareness of the issues is critical in creating healthy environments in which all forms of life can prosper.